BERKSHIRE (IRE), Múltiple ganador clásico incl. Royal Lodge Stakes (ENG-2), Darley Stakes (ENG-3), Chesham Stakes (ENG-L), etc. PURR ALONG (USA), multiple ganador clasico en Europa, incl. Pearl Stakes (IRE-3), Prix du Calvados (FR-3), 2do. May Hill Stakes (ENG-2), 3ro. Duke of Cambridge Stakes (ENG-2), etc. EMERALD STAR (GB), Chartwell Fillies’ Stakes (ENG-3), 3ra. Karin Baronin Von Ullmann-Schwarzgold-Rennen (GER-3), etc. VOLUME (GB) Swettenham Stud Fillies’ Trial Stakes (ENG-L), 3ra. Investec Oaks Stakes (ENG-1), Epsom; 3ra. Darley Irish Oaks (IRE-1), etc. MOHAVE PRINCESS (AUS), ganadora en Sudáfrica, incl. Devon Air Stakes (SAF-L), 2da. South African Oaks (SAF-1), 3ra. Yellowwood Hcap. (SAF-3). NINJAGO (GB), ganador en Inglaterra, incl. Pavilion Stakes (ENG-L), 3ro. 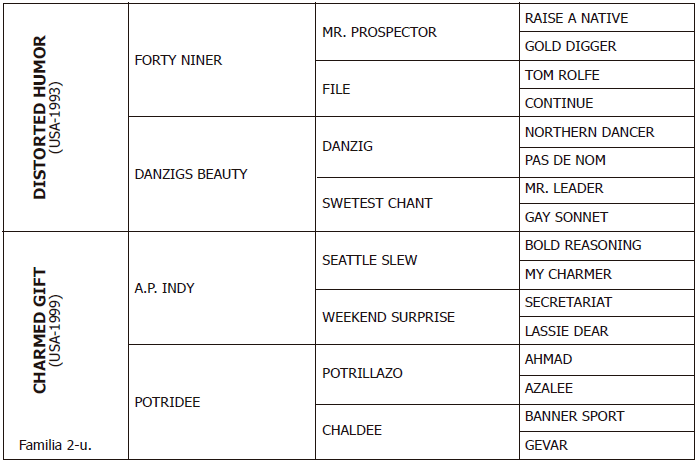 Carnarvon Stakes (ENG-L), Washington Singer Stakes (ENG-L). SPECIAL MEANING (GB), ganadora en Inglaterra, incl. Warwick Fillies’ Stakes (ENG-L), 2da. Grosser Preis der Mehl-Mulhens Stiftung (GER-L), 3ra. Princess Royal Stakes (ENG-L). Romantic Seeting (GB), ganadora en Inglaterra, 2da. Musidora Stakes (ENG-3). Weltmacht (GB), ganadora en Alemania, 2da. Diana Trial Stakes (GER-2). Hors De Combat (GB), ganador en Inglaterra, 2do. Thoroughbred Stakes (ENG-L), 3ro. Joel Stakes (ENG-2). Room Key (GB), ganador en Inglaterra, 3ro. Vintage Stakes (ENG-2). Orsello (GER), ganador en Alemania, 3ro. Oppenheim Union Rennen (GER-2). Give Way Nelson (IRE), ganadora en Alemania, 2da. Campanologist Cup (GER-L). Jadel (GB), ganadora en Italia, 2da. Premio Alessandro Perrone (ITY-L).